They have never done much touring. Savoy has been a studio band, with five albums released so far. Here comes the summary. But that’s not exactly what it is, either. Because Paul Waaktaar-Savoy, Lauren Savoy and Frode Unneland have re-recorded some of the previously released songs, live in the studio. Those, plus three new songs, make up the first album. While the other songs on this double album, are in their original versions. “Karma Boomerang” is one of the good, new songs. This is Savoy at their best. They are best when they do mid-tempo songs or melancholic ballads. And that’s why “Star”, “Velvet”, “End Of The Line”, “Tears From A Stone” and “Whalebone” are among the super-tracks on this outstanding collection. Savoy is more than a side project for Paul Waaktaar-Savoy from a-ha. This is excellent and durable pop music worth owning. Savoy is Paul Waaktaar-Savoy and his wife Lauren Waaktaar-Savoy. They both live in New York. Plus drummer Frode Unneland, who lives in Bergen. Paul is Paul from a-ha, Savoy is the married couple’s side project. It has lasted for 12 years and five albums. About time to release a “best of”-collection? “Yes”, they thought. And gathered 14 songs on one CD, of course including the lovely “Velvet” with which they had their breakthrough. A lot of great pop-rock and good melodies. Then they had another thought: we’ll try to record some other old songs over again to see what happens. They did that, and seven of them were so good that they chose to include them here. Plus three brand new songs. Therefore we’re left with a very special double CD. But it works, it absolutely works. The 2007-versions are of a very good standard, perhaps with a bit more adult pop-sound. But they are both catchy and pleasant to listen to. I think maybe that CD will be the most played. Interesting, but overly voluminous, and slightly uneven summary of Savoy so far. In many ways this collection is more interesting than most of those released in the retro-industry. Fourteen “best of”, seven re-recorded and three new songs. So it both functions as an introduction to the band, and those who may be faithful fans get to hear old songs in a new setting and a couple of new songs. On paper, a collection which has something for everyone. The question is then if most people need 24 songs with Savoy. Based on this double album, the answer will have to be: maybe. Paul Waaktaar-Savoy is a gifted pop-songwriter, especially with the melodies, and there are several pearls in this heap. The highlights are either so good that they fit the smaller and more reckless sound, or they sound so different in format that you deliberately can avoid thinking of Norway’s biggest pop band. Therein lay the good reasons to stay indoors and listen to Savoy. On the other side are the songs that are either banging against a grey wall, or you catch yourself wondering if they wouldn’t work better with a certain quasi-philosopher as vocalist. As a “best of”-collection, the two categories are a bit too evenly divided. On the other hand, “Velvet”, “Star” and “Reasons To Stay Indoors” is pop music on a level that only the very best a-ha albums can match. Highlights: “Reasons To Stay Indoors” and “Velvet”. a-ha’s Paul Waaktaar-Savoy’s side project can these days look back at 13 happy years. That is celebrated with the release of a “best of”-collection. A double-CD, which in no way suggests that 13 is a dangerous number to be connected with. Because when the married couple Waaktaar-Savoy and Lauren Savoy, together with their partner, drummer Frode Unneland, finally were going to make a “best of”, it wan’t enough to just leaf through the back catalogue, look at the songs’ chart positions, choose and then only think about the song order. No, the creativity which has always been one of Savoy’s trademarks, couldn’t be undermined this time, either. Because one of the two discs includes re-recorded versions of the “old, good ones”, done live in the studio! The band claims that they have therefore achieved getting the same feeling for this old material as they have for the brand new ones. And in my ears, this “new-old” pop music sounds both potent and fresh. This is a slightly different “best of”-collection. CD 1 (10 tracks) includes seven new versions of old songs (among others “Lackluster Me”, “Whalebone” and “Rain”) and three brand new songs, like the latest single “Karma Boomerang”. CD 2 (14 tracks), on the other hand, is a traditional collection of hits with the pearls “Velvet” and “Star” as highlights. This is still a great collection of pop music – unless you already have Savoy’s five albums in your shelf. Savoy have twelve years and five studio albums behind them. About time for a summary. The band has basically been a playground for Paul Waaktaar-Savoy and his wife Lauren. The third member has always been Frode Unneland from Åsane [near Bergen]. Savoy have been getting good reviews all along, but have still ended up in the commercial shadow of a-ha. And it hasn’t helped things that the band has barely toured. They have mainly been a pure studio band – sometimes on, a lot off. The songs aren’t too far from a-ha’s sound, but Savoy aren’t that pompous. They also make more use of the classic pop formula. Just listen to the catchy and summer-light “Grind You Down”, with a 60’s-inspired Lauren in front. The songbook actually includes a total of 24 songs. The twist is that seven of them have been re-recorded, live in studio. There is also three new songs. When three year old songs, like “Whalebone”, needs a new version, it may indicate that Savoy haven’t always been too good at making the final decisions in the studio. The double album is a nice introduction to Savoy’s song universe. The married couple Waaktaar are capable of making good songs. Can we hope for some more concerts as well? Paul and Lauren Waaktaar-Savoy are sort of “our” Paul and Linda McCartney. Musicians who enjoy something so rare – in life in general, not to mention the music business – as a long-lasting, happy marriage and a rewarding, creative collaboration. There is one distinctive difference between the two couples, though. Paul and Linda travelled around with their thumbs pointing to the sky and a roguish sparkle in their eyes, whereas Paul and Lauren write songs with titles like “Rain”, “Lackluster Me”, “Tears From A Stone” and “Grind You Down”. All the songs mentioned above are included on the first CD of the double album “Savoy Songbook Vol. 1”, all in all a slightly same-sounding collection of re-recordings of seven old, previously released Savoy-songs, and three brand new. CD number two is a more conventional “greatest hits”: 14 songs they haven’t dared to change, probably because they are, for the most part, simply really good. As with all successfull, cool couples, it can occasionally be a bit tiresome to relate to them. Paul’s works with a-ha has a drama that sometimes doesn’t appear in Savoy, whose albums *can* be a bit grey. CD 2, which probably should have been the first disc of this collection, still shows that their best moments are both stronger and more varied than one might think at first. And it includes the debut single “Velvet” (1996). Is there a more beautiful “Norwegian” pop song? I don’t think so. Review by Morten Ståle Nilsen. Savoy are more concerned about correcting old mistakes, than risking potential new ones. Most bands have probably been thinking that their old albums have something that they want to change later, but very few have the time and money to do it. The married couple Waaktaar-Savoy, who are the main forces behind the popband Savoy, actually has the means and the opportunity to embark on such a project. 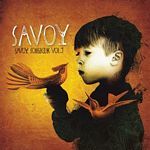 On their latest release, which partly is a collection of the best from Savoy’s career, they have also included ten newly recorded songs, where seven of them are old songs that have been given an overhaul in the studio. The Waaktaar-Savoys display a good ear for pop, as usual, which is most apparent when they make use of the old Motown-trick to refresh their back catalogue. But where Berry Gordy’s secret hit formula was to pitch up the tempo of the songs after they had been recorded, Savoy have used more drastic methods and instead re-recorded them in faster versions. There is probably a million other changes that also have been made to the old songs, but for the average record buyer it probably won’t matter much if vocoder, strings or vibraslap has been added since the last time. This is probably most important for Savoy themselves. The rest of us will probably get more pleasure from the second part of the double album, where most of Savoy’s pop-highlights through five albums are included. New and old in a big mix. Many artists have attempted to do what Savoy have partly done on this double, retrospective album. Instead of a normal “greatest hits”, they have chosen to re-record seven of their best-known songs. They also present three new songs. The first of the two CDs on this album contains these ten songs. The second one contains a “best of” with 14 old recordings. This is in other words a triple-project; new songs, old songs with new arrangements, plus a summary of the five album long career from 1994 to 2004. Savoy was formed in the shadow of a-ha, as Paul Waaktaar’s own musical hothouse. The band carries the last name of Waaktaar’s American wife, Lauren Savoy. The married couple take turns with the lead vocals, while Frode Unneland plays drums and does backing vocals. The ten tracks on the first CD has a similar musical expression. All the songs are set up with lavish arrangements, big rooms with a simple furnishment, often consisting of acoustic guitars and distinct drumming, but surrounded by deep walls of sound, created by keyboards, synths, choir and vocal echo. The new songs are the already released single “Karma Boomerang” plus “Best Western Beauty” and “Barefoot In A Denim Jacket”. They fit well together with newly arranged, but well-known Savoy-songs like “Star”, “Reasons To Stay Indoors” and “Lackluster Me” and make this ten-track album into a complete, but at times boring album. 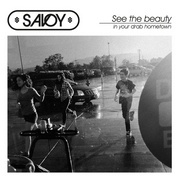 CD number two reminds us that Savoy originally were more energetic and daring than they are in 2007. The band has, for better and for worse, a distinct and recognizable sound. For better because there is an unfaltering and catchy quality at the basis of the project, for worse because the surprises are few and the monotony is at times striking – especially on the newer songs. After five uneven albums: Here comes an uneven “best of”, spread across two CDs. But Paul Waaktaar-Savoy’s band doesn’t have that many good songs. One CD is a collection of singles and/or favorite songs, on the other CD they have three new songs and seven re-recorded songs, but they don’t manage to add much to the old material. 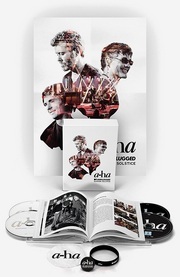 Compared to a-ha’s singles collection, this doesn’t lead to a good result: Savoy’s music lacks drama and ambition, the creative tension that characterizes a-ha at their best seems to disappear when the Waaktaar-Savoys are working in their home studio. In addition, Savoy is also a rarity in that it’s a band with not just one, but two bad vocalists. Across two CDs, we get way too much of Paul Waaktaar-Savoy’s monotonously plaintive main vocals, and Lauren Savoy’s flat singing doesn’t help much. In little moments, this collection shows Paul Waaktaar-Savoy’s greatness as a songwriter – “Star”, “Tears From A Stone”, and especially “Velvet”, Savoy’s very first single and still their best song. But too often he disappears into a grey fog of whining indie-rock. Review by Bernt Erik Pedersen.